That was against “every tenet of good (corporate) governance”, Alex Beard, director of a Washington-based global financial advisory firm and a former professor from Georgetown University, said in a signed article. Beard also questioned Harvard’s moral obligation, asking if it would return the funds “or rectify it in some other way”. 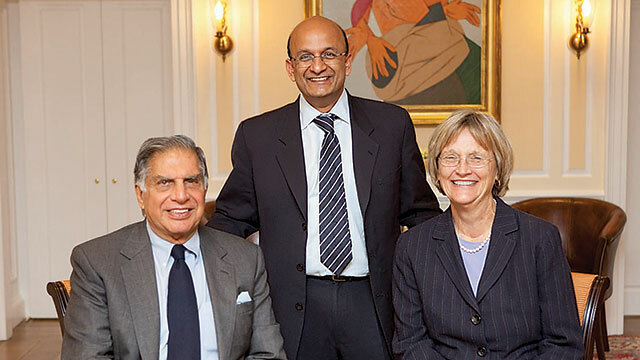 The 2010 donation agreement — the largest from an international donor in the 102-year history of the Harvard — between HBS Dean Nitin Nohria and business magnate Ratan Tata that resulted in the subsequent construction of Tata Hall in 2013 is under a parliamentary scrutiny in India. A sub-panel of the Public Accounts Committee was looking into the $50 million donation and other such gift pacts, suspecting the money may have been donated in violation of tax rules, according to a member of the panel. “The committee’s major concern was to check misuse of tax exemptions in cases where donations were made outside the country. The committe recommended knowing the usefulness of such donation for the country. And if it was not useful (to the country) then the taxes should be levied. It was meant for all such trusts and charitable institutions and not Tata Trusts alone,” former BJP Rajya Sabha member Ajay Sancheti, who was part of the panel when it prepared the report, told IANS. He completed his term in April this year. It may have been done to promote “personal interest” of some of the trustees of Tata Trusts — charitable outfits with funds belonging to the public, according to the report, some excerpts of which were shared with IANS. Incidentally, the matter has come to fore after Tata Institute of Social Sciences (TISS), previously a significant beneficiary of Tata Trusts funds, stopped financial aid to poor students in 2017 due to funding deficiencies. In the article on dailycaller.com, Beard has raised “an equally important concern” related to “the conspicuous role played by HBS Dean Nohria in this questionable transaction”. “His good fortune in landing such a large gift for the HBS endowment would initially seem logical for the new Indian-born dean and shouldn’t have seemed suspicious.